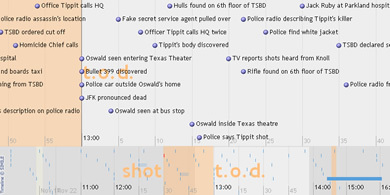 "Timeline is a DHTML-based AJAXy widget for visualizing time-based events. It is like Google Maps for time-based information. Below is a live example that you can play with. Pan the timeline by dragging it horizontally. "Just like Google Maps, Timeline can be used with zero software installation, server-side or client-side. And like Google Maps, you can populate Timeline with data by pointing it to an XML file (here is the data file for the timeline above). But Timeline is not limited to only that means of loading data. "